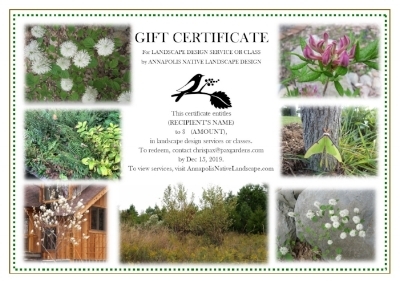 Find the perfect gift for that special person who cares about their landscape and wants to use native plants. Some of you have been asking me for this on the website, so now finally here it is! You choose the amount, and the recipient chooses how to spend the gift— it can go toward classes, a Small Area Design, or a larger Co-design Master Plan. Over the years I have done gift certificates from parents to new-home-owning children, from spouses to each other for birthdays or anniversaries, and also as Christmas or Valentine’s Day gifts. Got a gardener on your list? Especially if they are interested in the environment or native plants, this could be just the right gift! Select the amount for this gift certificate. The email where I can contact you (usually within 24 hours). We'll get this gift all squared away as quickly as possible! If you like, you can include a personalized message on the gift certificate (optional).